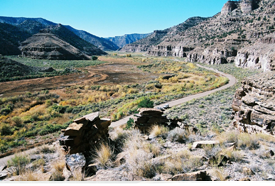 Nine Mile Canyon is often referred to as the World’s Longest Art Gallery. And indeed, weekend visitors to this canyon are treated to a visual feast of images pecked and painted onto the canyon walls ï¿½ reminders of long-disappeared peoples who used the sandstone faces as a canvas for their thoughts and dreams. The “rock art” is a national treasure that prompted the Bureau of Land Management and conservation advocates to nominate the canyon and its thousands upon thousands of images to the National Register of Historic Places. There are few places anywhere that have so many rock art images. 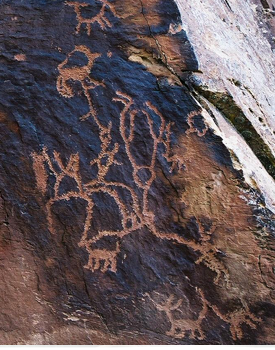 Why was Nine Mile Canyon such an inspiration for prehistoric artists? The answer to that question eludes scholars. It is not unusual that ancient peoples would leave behind such remnants of their passing. What is unusual is the staggering number of images: More than 500 localities with ancient rock art have been formally documented, most of them with dozens and sometimes even hundreds of individual figures. And experts believe we have only documented maybe 10 percent of the rock art sites in the canyon. Prehistoric images are found throughout the world, and they are especially common in the western United States where arid climates have helped preserve them. In Nine Mile Canyon, scores of dedicated volunteers, most from the nearby community of Price, have spent the past two decades carefully documenting, photographing and sketching these sites as part of an ongoing campaign to protect and preserve them for future generations. The rock art of Nine Mile Canyon attracts thousands of enthusiasts each year, tourists and scholars alike who marvel at the intricate messages from the past. This is not a recent phenomenon. 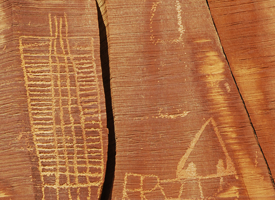 Visitors have speculated for more than a century on what the images might mean, noting similarities in styles and techniques with rock art found in the Southwest and western Wyoming and the Great Basin. Some have come up with elaborate theories that the images are solar calendars or fertility scenes or representations of actual events that have long disappeared into the mists of time. The truth is that it is impossible for someone living today to put themselves into the minds of someone living a thousand years ago, to know what he or she was thinking. But it is safe to say the images were created to express the people, animals, events and beliefs of importance to humans at that time. These images could have been representational or abstract, and they would undoubtedly have included themes of birth and death, marriage and fertility, family and foes, food and water, deities and demons, time and eternity. They are images that are still revered by modern Utes and Hopi, who view their desecration as an assault on their cultural history and spiritual beliefs. 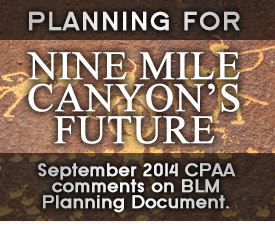 2007, CPAA has been working closely with the Bureau of Land Management, Utah School and Institutional Trust Lands Administration, the Nine Mile Canyon Coalition and three of the largest private landowners in the canyon ï¿½ Hunt Oil of Dallas, Texas, Bill Barrett Corporation of Denver, Colorado, and Sekani LLC of Salt Lake City ï¿½ to identify the risks to the world famous rock art found here and to devise strategies that will further their long-term preservation. Seven large blocks of the canyon have been investigated to date and hundreds of sites have been identified, carefully photographed and documented, and examined for the potential risk that they could someday be lost forever. Steps are now being taken to not only improve the protection of these remarkable sites, but to enhance the experience of those who venture into the canyon to experience them first hand. Through the generous contributions of our partners in this endeavor, we are making remarkable progress. But there is so much more to be done. Roughly 90 percent of the canyon remains unknown to archaeologists and to the federal officials who manage them. Private property owners have, for the most part, been good stewards of the archaeology here over the past 100 years. When areas are posted with “no trespassing” signs, it slows the rate of vandalism and graffiti. Road dust has been a serious problem in the past, but efforts by Bill Barrett Corporation to aggressively control the road dust are working. Since the road has been treated with dust suppressant, most rock art sites are noticeably cleaner and more visible to visitors, presumably because they have been washed by rainstorms. Those in rockshelters remain obscured by white dust. Vandalism and looting has been a problem for decades ï¿½ and it still is prevalent. One famous site was vandalized in the fall of 2011. Graffiti is a nagging problem. Folks just haven’t realized ï¿½ or accepted ï¿½ the fact that it is not acceptable to add your own names, initials and dates. The lack of comprehensive planning at popular sites has led to a spider-web of trails leading to those sites. And in some instances, those trails go up and over standing walls or have resulted in erosion that has exposed artifacts ï¿½ artifacts that are then vulnerable to improper removal. Most sites next to the Nine Mile Road have been impacted by human activities ï¿½ mostly vandalism, graffiti and road dust ï¿½ and they are in generally poor to fair condition. Those higher up and farther from the road are generally in good to excellent condition and only rarely have they been maliciously damaged. The vast majority of the lands along the road are private. Some are posted “no trespassing” and others are not. Please respect private property and never trespass. Many of the most spectacular rock art panels are visible from the road and can be viewed easily with binoculars. Nine Mile Canyon is experiencing heavy truck traffic due to oil and gas exploration, pipeline development and continued ranching activities. Please pull your vehicle as far to the side of the road as possible, and never park on blind corners. Always go into Nine Mile Canyon prepared for unexpected. The road is notorious for causing flat tires, and there are no repair shops or gas stations. Nor are there convenience stores where you can buy water, batteries, film or other essentials. Please do not touch the rock art as oils from your skin can accelerate erosion. And never do “rubbings” or “tracings” of the panels. The abrasion has the effect of rubbing the panel with sandpaper, eventually destroying it. Camping is not allowed in the canyon bottom. There are several primitive camp sites in Gate Canyon and on the rims of Nine Mile Canyon at the top of Gate Canyon, Dry Canyon and Cottonwood Canyon. All of these routes currently have heavy truck traffic. Treat rock art with the respect you would have for paintings in an art gallery or cathedral. These are irreplaceable remnants of ancient peoples who lived, worked, laughed, played and died here, certainly with hopes and dreams not unlike your own. Furthermore, they are of tremendous spiritual significance to native peoples.